Most presenters tend to find themselves at two extremes of a spectrum: They either use no animation or transition effects at all, making their slides deathly boring, or they use too much, adding every bell and whistle they can find to their slides. But animation can be used in a way that both captures your audience's attention and also furthers your message. 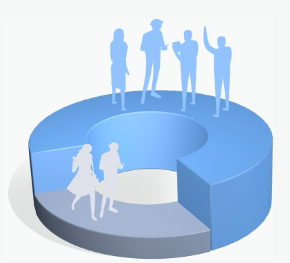 With modern presentation tools, everything inside your slides can be animated. This way you can create a visual storytelling experience, instead of simply relaying a bunch of stats, figures and text. In this guide, you'll find some tips and tricks for creatively and effectively using animation in your presentations. When creating a presentation and giving it that injection of life that only animation can, there are a few things you need to remember. Don’t confuse or overwhelm your audience with too much animation. Keep the amount of animated effects to the minimum necessary. Make sure that it’s not overpowering the message or the visual impact. It’s easy to go overboard with all the options inside presentation software, just make sure you don’t go overboard. Stay consistent with the animation effects you use. When you add animation to elements in your slides, stay consistent with your choices. Stick to only two and, at the most, three types of animation. Don’t apply an “enter from left” animation to the title and then an “enter from right” to the subtitle, much less a “pop in” to the rest of the text. Follow a direction so that the information is easy to grasp. Following along from the previous point, use the animation effects to follow a direction for your content. Choose from top to bottom or from one side to another, or any other effect that can call attention to the most important point in each slide. When designing your slides and adding animation, think of the way an audience scans information. Imagine your audience looking and your presentation and add effects accordingly. You can add an important animation to the parts that need more attention and less to the larger filling content. Don’t animate in the wrong direction--your audience will thank you for it. With these simple tips you should be able to use animation in your slides without a hitch. With the help of animation, a set of slides can be turned into a flowing scene. In her book Slide:ology, Nancy Duarte presents the idea of turning the slides into a series of movements. This progressive animation style gives the viewer a completely different feel. Therefore, capturing their attention as they wait for what’s to come. Although Duarte's advice is primarily for creating a PowerPoint animation, this short presentation created with Visme flows seamlessly from one slide to the next, as if the viewer were following a path. To create a presentation like this, you have to think of the big picture. Imagine the slides connected to each other in a larger space and that the data follows a path inside it. The first thing you need to do to the slides is to get rid of any elements that would generally show up on every slide. For example, your logo on the bottom right corner, page numbers, or headers and footers. The slides need to have connecting elements between them. A blue area starts on one slide and continues to the next. Elements can bleed off at the sides to seem like the slide is only looking at a piece of the larger space. The transitions then mimic the movement that a person would take along a path: up, left, up, right. The elements move in the direction of the transition completing the illusion. For an added bonus, the elements in each side can also be animated to create even more visual impact. When applying the transitions to your slides, it’s important to remember a few things. Otherwise, you might overdo it and your presentation will look messy. Thankfully, Visme doesn’t have options like broken glass, swirls, and pixelating effects. Let’s just stay away from those. Do use the transition if it helps tell the story. Do use the transition if it guides the viewer through the presentation. Do use the transition if it helps to add emphasis to a specific section. Do use transitions AND specific element animation if they balance each other. Do always use the preview function to check on your progress. Don’t use the transition if it doesn’t add anything positive to your presentation. Don’t use different transitions, unless you are creating a scene like we explained above. And if so, be mindful of how you use them. Don’t add transitions which confuse and distract from the story. Now that we have looked at some animated transition ideas, let’s move on to the elements inside your slides. In Visme, you can animate pretty much anything, from shapes to text to graphs. As we mentioned before, elements can have a relation to the transition. But they can also have other visual effects. Let’s take a look at some creative animations of elements inside slides. One creative way of using animated elements is to mimic the construction of a complete image. The way to do this is to design the last slide of the presentation first. The idea is to have all the pieces of the puzzle laid out in their correct place and then work backward. Create the final slide with all the data and information placed in its final position. It’s easier if each snippet of information has its own separate section. Duplicate the slides in the slides list. The number of duplicates you need depends on the pieces of the puzzle you added to the finished product. Once you have the duplicates ready, go to the last one and animate the entrance of the last piece of data. Continue one slide up, delete the piece which you just animated and animate the one that comes before it. Work your way back, deleting and animating each piece of the puzzle until you get to the very beginning. This presentation doesn’t need transitions because the elements are doing all the work. Use the same type of animation for all the elements to maintain a unified style. There is this handy little tool in the Visme editor called the Graph Engine. All graphs generated with this tool are automatically animated. Therefore, they are perfect for adding to your animated presentations. Click on the Data tab on the menu on the left and select the option Charts (it’s the first option at the top left). Choose the type of graph you want to use and input the data. You can do it manually or import from an Excel spreadsheet or Google sheet. Customize the colors and fonts in your graph to match the rest of your design. Pick the type of animation you want the graph to have. Choose from: bounce, elastic, ease-in and ease-out. Whichever you use, make sure it fits the animation style of the rest of the presentation. Insert it into your slide. It will animate automatically. Yes, there is an option to turn off the animation if you don’t want to have it. Then, you can add an animation inside the slide as you would for any other element. When you add a Venn diagram to your presentation, it doesn’t need to be static. Why not animate each section and bring it to life? First, animate the circles (or whatever shape you are using) by customizing their entrance onto the slide. Once the diagram is complete, animate the text to appear in its corresponding area of the diagram. Since there might be many parts to your Venn diagram, make sure the animations don’t look jumpy or slow. Try different time increments until all the parts flow in a pleasing way and don’t confuse viewers. You can use the timeline in the Objects tab for help. Using gradients to animate your slides is a subtle way of adding movement to a story. Animated gradients can be incorporated in many ways. For example, you can progressively change the color of the background from green to blue. You can also let the viewer discover an image as the slides progress. Gradients can also be added to darken a shape as the story unfolds. The trick to using color gradients is to create a color palette. This way you can control the progression from one color to another. Use the hex colors so that you aren’t guessing what the next color should be. A blue to green progression can be used for a presentation about rain cycles, for example. You could even use a day-to-night animated scene that changes from slide to slide. The sky can enter sliding in from the top or bottom like a theater backdrop, like we did in this short animation created with Visme. Here are some important tips to remember when animating the elements in your slides. Do consider the balance of all the animations. Do they all need to be there? Do animate the most important snippets of information. Do use the same style of animation to maintain a unified design. Do use the timeline in the objects tab for help with the timing of your animations. Do always use the preview option to check your progress. Don’t animate every single thing in your presentations. It could get overwhelming. Don’t mix too many styles. The movements will lose balance. Don’t set all animations to move at the same time. Give them some progression. 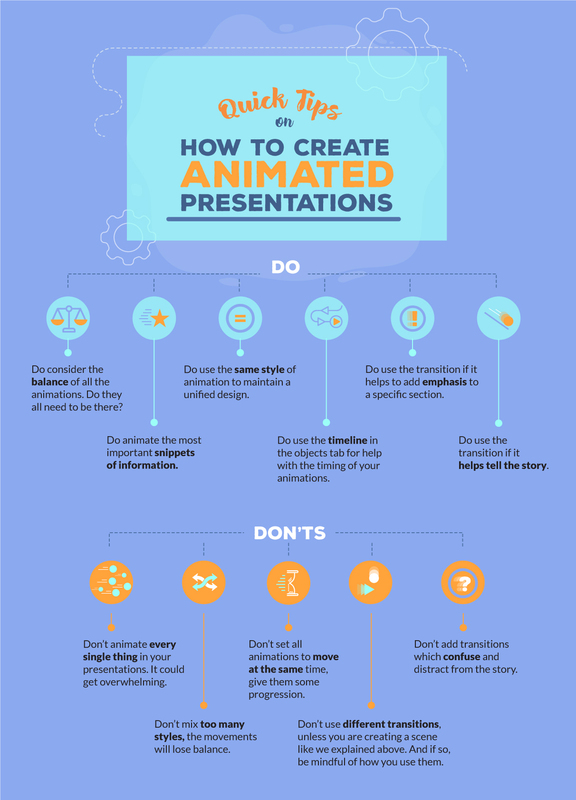 How Are You Animating Your Presentations? Now that you have seen some creative animation ideas, which one will you use in your next project? Are you already using animations in your slides? Leave us a link to one of your Visme projects in the comments below so we can check it out! Want to set yourself apart from the rest? Start creating amazing presentations within minutes with our easy drag-and-drop software. Access dozens of sleek templates, 100+ free fonts and millions of images and icons right now.